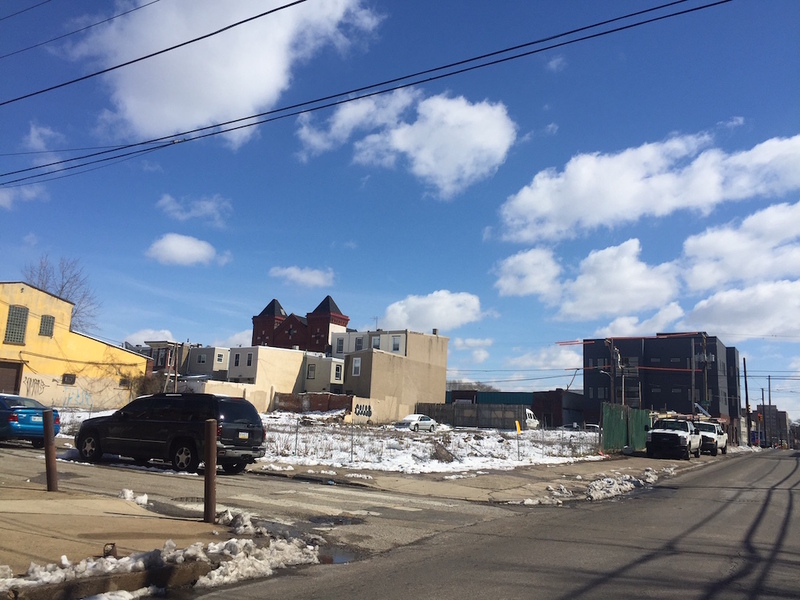 It wasn’t even two weeks ago that we pointed out some zoning notices on the large vacant lot on the north side of the 2600 block of Poplar Street and felt a sense of hope accompanied by a pang of uncertainty. This parcel has been sitting vacant for a bunch of years, owned by the Graveley family, whose roofing business is located nearby. We’ve thought this property would get developed previously, with a plan for an apartment building with 75 units and 38 parking spaces coming down the pike in 2016. We learned that wasn’t gonna happen last fall, when we heard about a meeting with the Fairmount Civic Association and that the project was shifting to a town home approach. When we last updated you on the project a couple weeks ago, we told you that the plans called for 23 homes with “below grade parking,” but even with that additional information, we weren’t exactly sure what to expect. A couple of commenters attended the most recent community meeting, and provided us with some key intel. One, the property is under agreement with AGA Developers, a company we’ve seen build great projects in Fishtown and South Kensington. This was a huge relief, as it gives us the strong sense that this project is actually going to get built. The other key bit of information we got from our readers is that the project was very well received by the community, getting unanimous support. We reached out to the developers, hoping to get additional clarity on just what we can expect to see here, assuming the ZBA gives the thumbs up. They were kind enough to get back to us, with all sorts of helpful information. 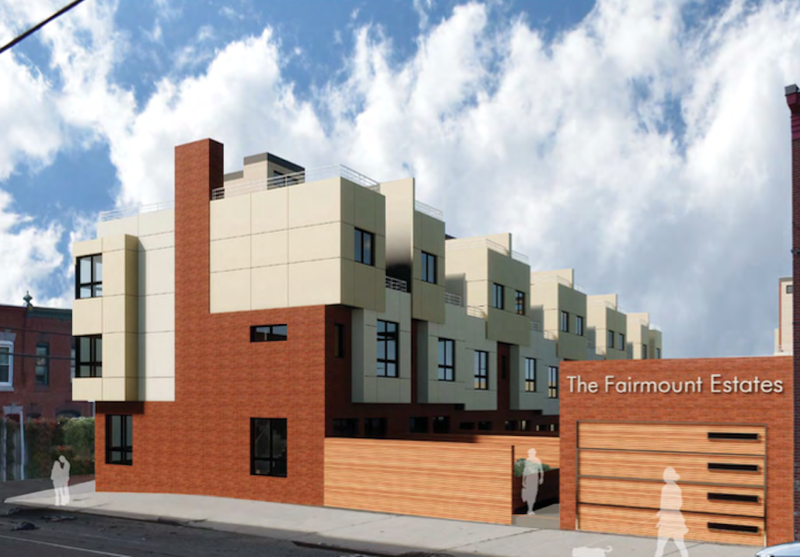 The project is called Fairmount Estates, and as we said it will include 23 homes, each with two-car parking. These parking spots will truly be underground, with access coming from 26th Street. Because the parking will be buried, each town home will have a roughly 1,000 sqft rear yard, which is something we don’t typically see with these kinds of projects. 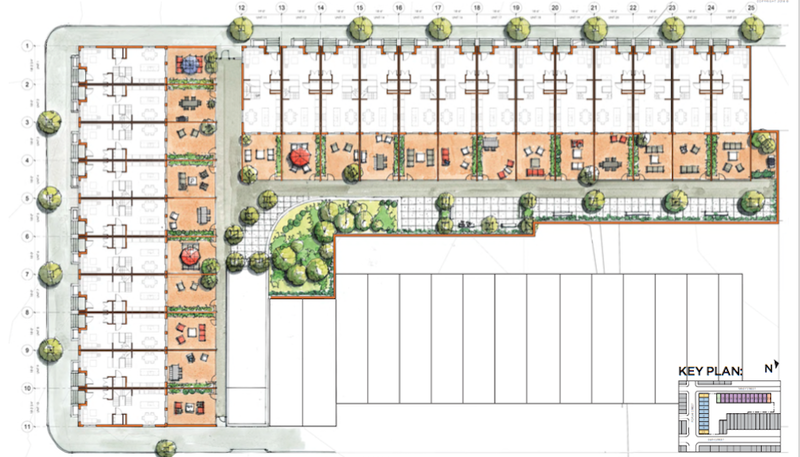 Also noteworthy, the development will include a roughly 10K sqft courtyard/dog park/green space which we believe will be exclusive to the residents of the development. Also, the homes will be quite fancy, with roughly 3,000 sqft of living space, elevators, and all the high end finishes you’d expect from a home with an elevator. Abitare Design Studio did the architecture work, and we can share several drawings of the project, to give you an idea of what’s coming. what is M&M doing with the 27th and Girard lot? If they were a public agency they would be excoriated for sitting on that lot. What is going on? minus the fact that they don’t own it. and already responded to a thread you’re in. this is super good news! did the neighborhood kill the 75 unit project? that proposal was for an apartment complex, w/ rental units. very glad to see that’s not on the drawing board for this parcel anymore. bottom line, it was a really lousy option for the neighborhood. From the developer’s point of view, townhouses are probably the best way of making the most return on the property. Probably an easy sell, as well, with the elevators, parking and tax abatement. Even the smaller, older houses in the area are selling for $300 a sqft at this point. Do the math. You’d have to rent for a very long time to generate that kind of return. Some saw it as a better option. Would have offered more support to the struggling Girard Ave business corridor. Both of these options are at the extreme ends of each other. Something in the middle would have probably been better off for the neighborhood. Just seems incorrect. Most lots in the area are 800 sq ft. No developer is going to offer a 1,000 sq ft yard when you could build another house. Why can’t you just buy the property and do whatever you want with it? Or, do they not want to sell? Why don’t you just buy the property and do what you want with it, K2? I’m not a developer and don’t have the means, but MM is and does, and also does very nice work. I think many people would very much like to see them pursue it successfully. You are correct. The rear yard is 400 square feet. There’s a total of 1000 square feet of private outdoor space for each home. The other 600 feet is the roof deck and the balcony off the 3rd floor master suite. Nice design. Would it have been that difficult to add some variety. The basic brick row house has a certain ‘beauty’ to its sameness as the rest of the row, its a straight forward, no tricks design. But with this design each house has got a lot going on with it, especially in the rear, so it would have been nice to see the details change alittle bit from house to house. I think slightly personalizing each house would increase the selling amount. Hopefully what is shown in the drawings as red/brown is real brick work and not just stucco. I totally agree! Introducing variety, or a variation on the theme, within the same build would be fantastic. This is being done in other cities (like Brooklyn), but not here, at least not yet. 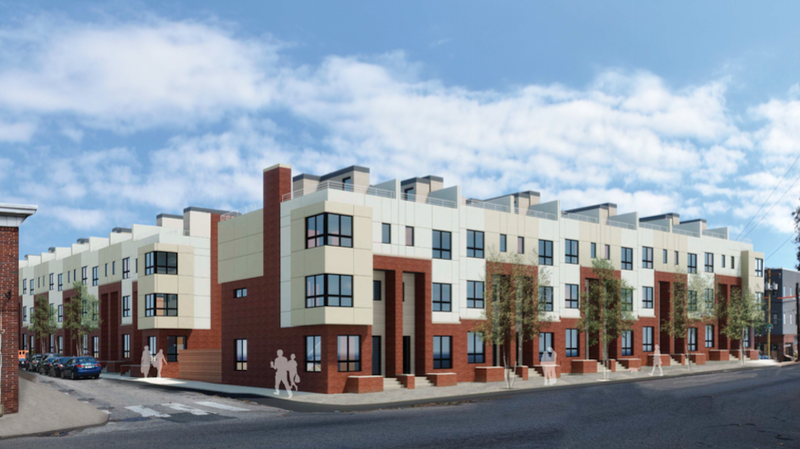 Philadelphia is still stuck in a design rut, unfortunately, with this same old repeat-the-design approach to townhouse development. Really unfortunate. Really?? Why would you be? Maybe Poplar Estates would have been more appropriate? Or, maybe Poplar Heights, Poplar Crest, or Poplar View…? I agree that using the word Fairmount is a bit confusing, but not totally so. Yeah, of course, though think about it, in that this development will be squarely on Poplar St., and we have Fairmount Ave. quite a distance, away, something using Poplar in the name would have actually worked quite nicely. It’s corny AF. (For the record, I’m 100% in support of this project). Whether they call it Fairmount/Poplar/whatever, I don’t know any “Estates” that have a birds eye view of say, the giant new tag on the side of the North Star landfill. While this is not “officially” Fairmount proper, it’s close enough for the name. I need to find out more about these amazing homes. There are no designs of this kind or size in the whole art museum/Brewerytown/etc. area. My partner is moving to Philadelphia in the near future and we are very anxious to give this development a serious look.